First, I'd like to say this thread is intended to get into the weeds of repairing the FD Speedometer circuit board to include the Odometer section and the Tachometer section of the board. The added bonus would be this thread gets greater visibility in the 3rd Gen section and would be easier to search. 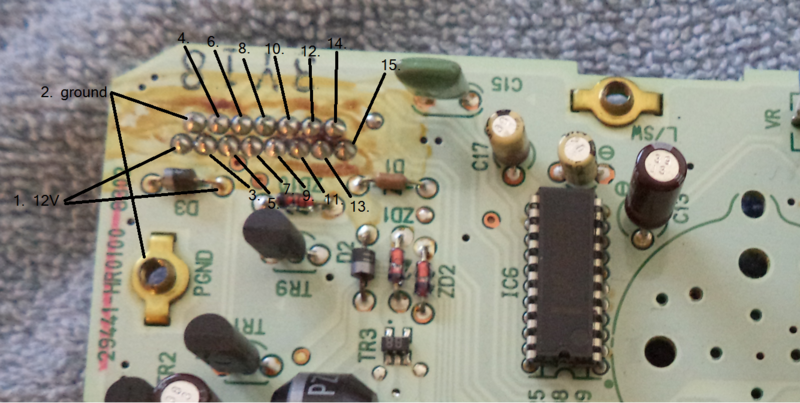 There is a conversation going between me and AlienR2 (Jeff) about the repair of the IC4 chip on the speedo board. I wish to move it here because the original thread was intended as an extremely simple FD tach/ odometer repair from the Interior/Exterior/Audio section of the forum. I believe that our conversation has morphed the thread into a detailed help file. 3. just got done figuring out how to fix an FD odometer -> the original "How To" thread. Partial speedometer board circuit diagram -->Great photos of a proposed schematic and flex print pin-out. And a few more posts to follow there. However, let's bring the discussion here. I need some clarification on your IC4 schematic diagram, specifically at some junctions. Follow IC4 Pin 1 (OUT1) output. Is that a straight shot to the base of TR8? Or does that output have a branch that connects to the resistor network of R28 through R31 to the 5V line and also connect IC4 Pin 2 (In-), Pin 3 (In+), and Pin 4 (Gnd)? Then take a look at IC4 Pin 8 (Vcc) input. Does the 5V signal only power it? Or does that same 5V line also connect to IC4 Pin 7 (OUT2) and Pin 5 (In2+) through the resistor network R21 through R24 (and impact the Speed Sensor branch)? How does TR5 play into the 5V line? Do you have pin locations for IC6 and the D751 (CPU) chips? Lastly, what does "4P", "8P+" and "8P" represent on inputs 11, 10, and 9, respectively? Thanks in advance for helping resolve any confusion! IC4 pin 1 connects to R30, R31, and TR8 only. My convention is: Where lines touch at 90 degree angles ("T" or "+") there is electrical connection; when lines cross without electrical connection I made a "C" shape so that the lines would not make a 90 degree angle. IC4 pin 8 connects to R23, R21, C8, TR5, R30, and R28. IC4 pin 7 connects to R23, D751, IC6 (pin 9, by the way), and R24. Concerning TR5... 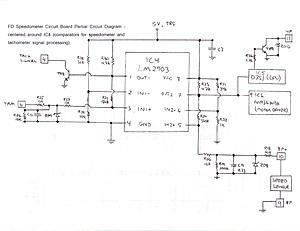 I did some tracing of the speedo board power supply components but I don't have a complete diagram. IC2 (TA78DS05P) is a 5V voltage regulator chip, but the 5V output did not appear to me to connect directly to IC4. The 5V output does appear to connect directly to IC1, D751, C3 (1000 uF; known for the corroded leads problem), and TR6. According to my notes, TR6 connects to TR5. I'm not sure why IC4 would be powered differently than the other chips using 5V power. I didn't determine the pin numbers for the D751. I did some web searching for D751 and AN8363UBK datasheets but didn't find anything. "4P", "8P", and "8P+" are labels printed on the instrument console's flexible circuit 'board'. I guess that P might stand for Pulses (so maybe the D751 output to the PCME for code 6 "4P" has only one pulse for every two pulses input from the speed sensor's "8P+"? ), but I'm not sure. Thanks, for taking a good look! I believe there are multiple errors in the schematic. Tracing the runs are difficult to do and by no means would I discredit your work. I hope that you do not take offense to my next series of questions. From an electrical perspective, some of these connections do not make sense. 1. Are you looking on both the top and bottom side of the board when tracing out each path for IC4? 2. The speedo board is dual layered so could there be a possibility of certain components passing over/under others without making contact? 3.a. How can IC4 Pin 8 & Pin 7 appear to share 1 resistor, R23? Pin 8 should be 5V power input and Pin 7 is an output to IC5 (D751xxx) and IC6. 3.b. If Pin 8 and Pin 7 share R23 then R24 would be a parallel path for Pin 8. Moreover, Pin 8 also shares R30 and R28 from Pin 1. 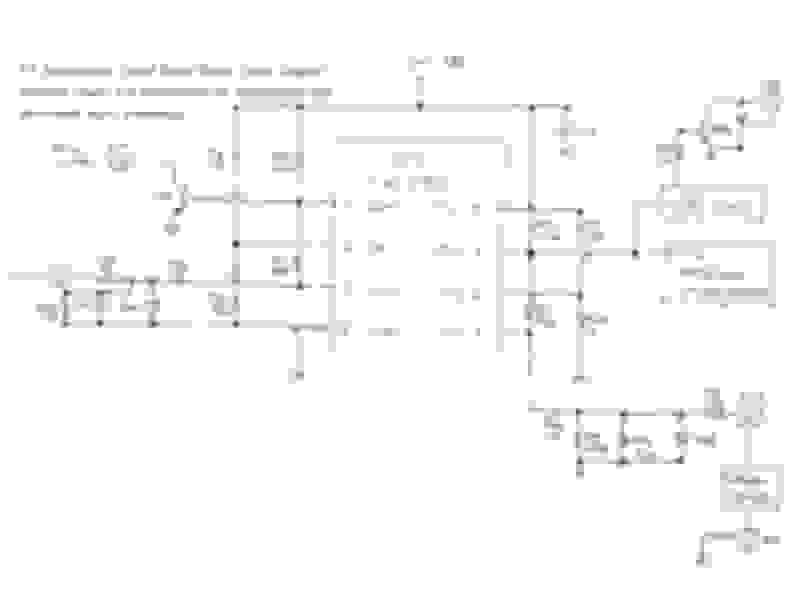 How can IC4 share so many input and output components? 4.a. If Pin 1 shares R30 and R31 with TR8 then how could they also be shared with Pin 8? 4.b. If one side of R30 and R31 connect TR8 then where do the other sides connect? 5. Could we refer to the D751xxx chip as IC5? I have to tell myself that it isn't Diode #751. 6. Perhaps more research is necessary to establish how TR5 connects to this circuit? To help reduce any confusion in other iterations of schematics, I recommend using bridges, some call them "C's", to indicate when a trace does not touch a crossing trace and a dot, ". ", to indicate an electrical junction, or intersection, between two traces. I wish I could see exactly what you are seeing so I could offer better guidance or work along side you. Presently, I do not want to unnecessarily yank out a working speedometer *knock on wood*. I think you are off to a good start in sketching out a schematic diagram. With added help, we could refine it to a proper reference point! Last edited by Gen2n3; 09-06-17 at 11:52 AM. You're fighting the good fight here! Thanks for all the work on this! Thank you, Dale! Are you preparing for the impending storm? To some extent, it doesn't look like it's heading my way (Pensacola is all the way in the panhandle, think Lower Alabama). On topic, it would be nice to eventually see a dummies guide to speedo/odo/tacho repair. You've come a long way in understanding the components and the circuit! I don't see any errors in the circuit diagram yet. 1. Yes, I inspected both sides of the board. 2. Not sure what you mean by "components passing over/under", but certainly traces do pass over/under components. 3.a. The diagram could have been drawn showing separate connections to 5V for Pin 8 and R23; it would be the same electrically because every device connected to a 'node' is connected to every other device connected to that node. R23 is a 'pull up resistor' (power supply on one side of the resistor and an output pin on the other side of the resistor) powering the LM2903 output OUT2. The schematic diagram in the LM2903 datasheet (see attached) shows that OUT[1,2] are not powered internally (i.e. 'open collector'). Without R23 (and R30 on the "1" side of IC4) OUT[1,2] would always be Low. Put another way, when the LM2903 OUT2 transistor is OFF (tiny current flowing into pin 7) the voltage at pin 7 is High because R23 is pulling the pin 7 voltage up; when the OUT2 transistor is ON (as much as possible current flowing into pin 7) the voltage at pin 7 is Low because the OUT2 transistor is trying to connect pin 7 to ground and the transistor can sink more current than is flowing through R23. 3.b. Not sure what you mean by "parallel path for Pin8". R24 is connected to pin 7 (OUT2), R23, IC5 (much better than "D751", thanks), and IC6 on one side, and to pin 5 (IN2+) and R20 on the other side. 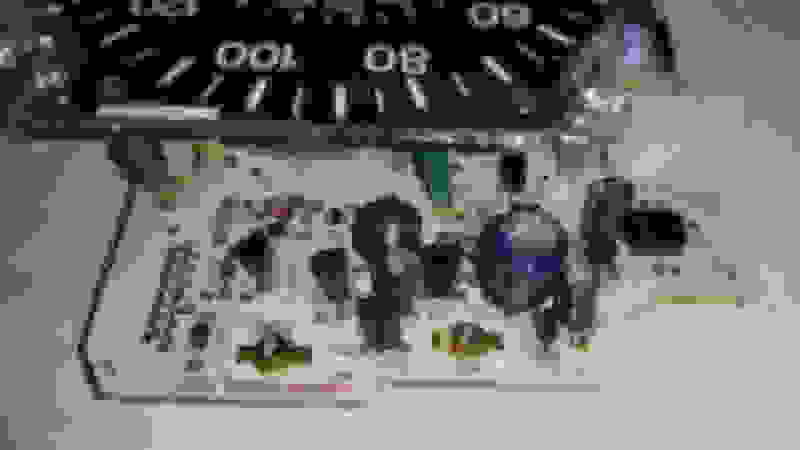 Connecting the output (OUT2) of a comparator (or op-amp) to its non-inverting input (IN2+) creates positive feedback, which increases the gain of the comparator. R24 is quite large, so the designers apparently only wanted a small amount of positive feedback to juice the comparators peformance, making High to Low and Low to High transitions faster. Pin 8 appears to share lots of components because all devices connected to power are also connected to eachother. The diagram could have been drawn showing R23, R28, and R30 etc having separate connections to 5V; electrically it would be the same. 4.a. By "share" do you mean electrically connected? Pin 1 is connected to R30, R31, and TR8. R31 is not connected to pin 8. R30 is connected to Pin 8 (and all other devices connected to 5V) on one side and to Pin 1, R31, and TR8 on the other side. 4.b. The other side of R30 connects to R28, TR5, C8, R21, R23, and Pin 8. The other side of R31 connects to Pin 3 and R27. 5. "IC5" is better than "D751". 6. Yes, I don't have a complete understanding of TR5's connections. Next time! I hope the "C" shapes I made (e.g. TR8 is not connected to R28) are clear. I have seen the dot notation used also. 6 "TAM",this signal gets turned into the signal to the tachometer, connector/pin: 3F (connects to Data Link [diagnostic] Connector and to the PCME terminal 2B,oscilloscope revealed ~15V ~1.4ms pulses that got closer together in time as engine speed increased; higher engine speed did not appear to shorten the pulses,42ms period between pulses at warm idle [s/b 720rpm] indicates 2 pulses per revolution). There is also a fourth nut plate labeled "PGND" but there is no external connection to it. 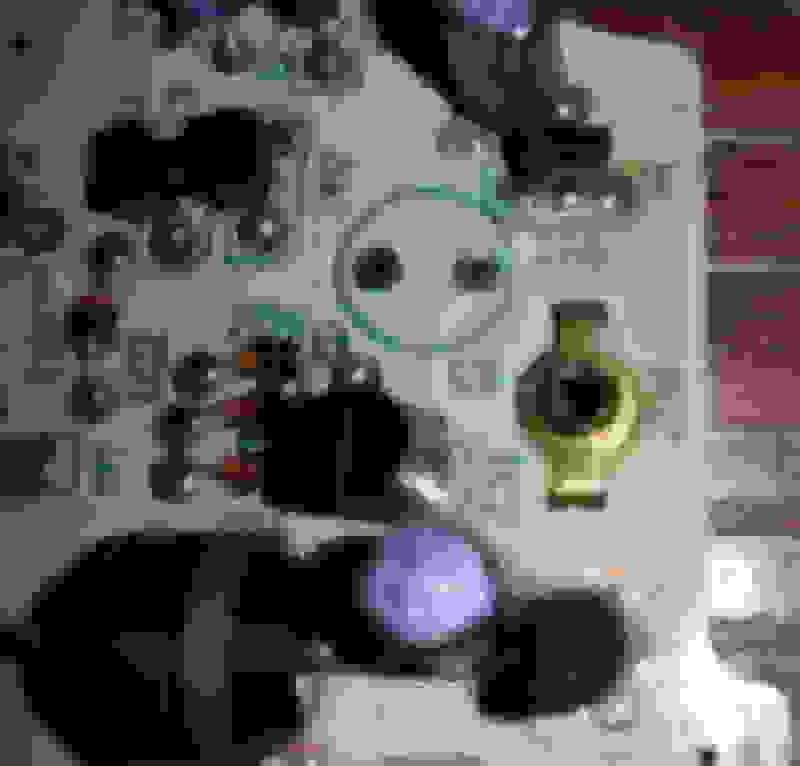 I used PGND to ground the speedo board for testing (PGND buzzes continuity to 2 above [i.e. speedo board ground supplied through ribbon connector]). Odomoter reading stored on speedo board IC3??? 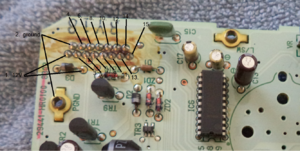 Speedo board IC3 (93C56EN, see attached data sheet) is a memory chip. I _guess_ that the odometer reading is stored on that chip and IC5 (CPU) reads the odo reading out and then transmits the odo reading to the display driver chip and keeps track of the distance traveled and writes the current odo reading back to IC3 periodically. The memory chip has EEPROM (non-volatile) memory (so odo value is not lost when power is switched off or lost). Probably, the CPU and display driver have no non-volatile memory. So... maybe it's possible to move the memory chip from your old board to a new board and keep your odo reading. It should be possible to read out the data from one memory chip and program the same data into a different memory chip. It _might_ be possible to do the reading and reprogramming without removing the memory chip from the speedo board. More questions than answers at this point. The data sheet (see attached) describes how to read and write data to the memory chip. I modified ALIENR2's schematic to highlight the junction points with dots, labeled IC5, and added Pin 9 to IC6. I have to admit that as simple as logic circuits go, the spaghetti that surrounds it often gets the better of me. I find it unusual to have all that circuit conditioning for IC4 Pin 3 and Pin 5. However, I am surprised to see relatively low resistance values to isolate Pins 1 & 3, and how the circuit uses +5V power as a reference voltage (probably 2V) to Pin 2 as a result of the R28 & R29 leg. I am equally surprised not to see any additional support circuitry around TR8. I'm not trying to dispute the circuitry just commenting on my deteriorating ability to recall electrical theory. Regardless, ALIENR2 (Jeff) has done a fine job at tracing out the schematic from the physical board and mapping out the ribbon connector! Additionally, Jeff, you are correct about IC3. That is where the car's odometer is stored. It is possible to remove IC3 from a bad board and install it into a replacement speedo board. DaleClark discussed it here - Post #9 with his link in Post #10. I will caution anyone who may want to alter IC3's memory (or swap it entirely). Altering the Odometer, aka odometer fraud, is illegal*. Shall we not devolve this thread into a discussion about odometer alterations? However, it is important to understand how mileage is recorded and what pins trigger the storage register in IC3's non-volatile memory. According to Dale's post, R15 & R17 on the speedo board play an important role in converting a speedometer between metric (km) and imperial (mi) units. * - Depends upon disclosure statements and/or local, state, and country laws. Good point about TR8; I wouldn't be surprised if I missed a resistor in between IC4 pin 1 and TR8 (like R36 for TR9). After further reflection I realize that current through TR8 is limited by R30, so there doesn't need to be a resistor in between IC4 pin 1 and TR8; as discussed above, IC4 does not output any current so there is no concern about IC4 over-driving TR8 or IC4 maxing out its ability to source current harmfully. Jeff, I'm curious about your bench setup: what do you use to test the circuit board? Nothing to brag about on my bench, unfortunately; soldering iron+solder+desoldering wick(need something to remove solder to separate the speedo motor and gauge face from the speedo board), 12V power supply, oscilloscope, digital volt/amp/resistance/continuity meter with pointy probes for precise placement on component leads or chip package pins, hand tools (needle nose pliers+wire cutters+screwdrivers etc), magnifiying glass, flashlight, breadboards with jumper wires and various spare test components (resistors, capacitors, voltage regulator chips etc; I used a 555 timer chip to generate test signals for speedo board inputs and also for input directly to IC4 IN1+ and IN2+ to test IC4 outputs),bulk wire and wires with clips for making connections to the boards. See attached, datasheet for TR6 (A143; it's a PNP transistor with base resistor included in the package). The datasheet starts on page 3. Jeff, You rock! From the datasheet, the proper part number for TR6 is PDTA143TS. The part is listed on DigiKey however, it is "Obsolete". Based upon TR6's specs, DigiKey listed 12 components, some are obsolete but the few "active" components are SMDs and lists a minimum qty for purchase at 3,000+ each. Here is the DigiKey List for PDTA143T Series. Mouser is the better site to order single quantities. Here is the Mouser Part Number List. The only difference between these 2 replacement are their size. However, I recommend using Item 2 because it requires less mounting conditions as stated in on the datasheet Pg 4 (PDF Pg5), "Note" section of Thermal Characteristics. Additionally, use the SMD Adapter for SOT323 SMD components referenced in FD Speedometer Components Post #33 when ordering Item 2. That is the same adapter that is recommended when replacing DA1. For space requirements on the speedo board, here is a shot of TR6. As you can see, it is close to C3 (removed) and C4. Location of TR6 is between C3 (removed) and C4. A SMD replacement component with adapter may be a tight squeeze. Location of TR6 with fully assembled Speedometer Circuit Board. What other components are you researching? I may hold off on updating the FD Speedo Parts List thread until your research concludes. See attached, datasheet for IC2 (TA78DS05P; it's a 5V voltage regulator that directly powers IC1, IC5, TR5, and C3 and maybe more). I'll post a datasheet for IC1 and some datasheet-like data for more of the transistors. 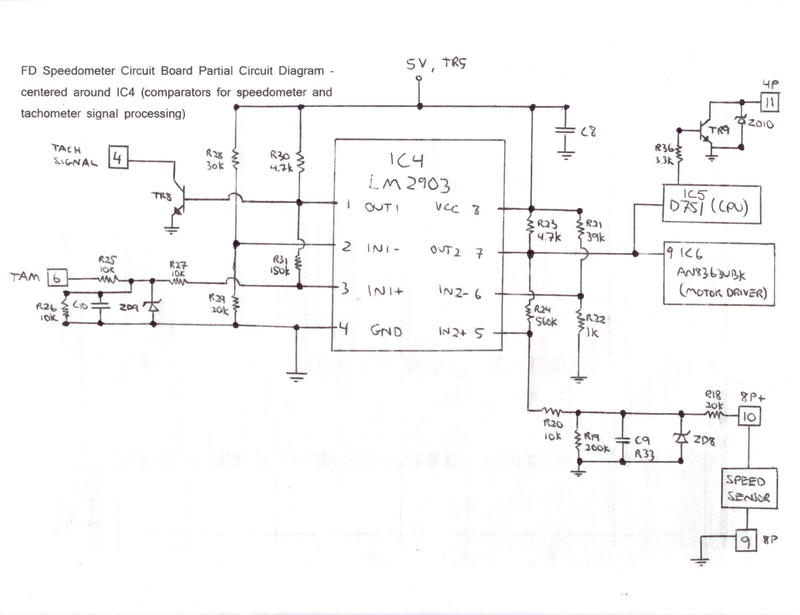 See attached, datasheets for IC1 (74HC14A; six digital logic NOT gates with hysteresis or "Hex Inverters with Schmitt-Triggers" if you speak electrical). I found two datasheets so I attached them both; either one will do. Here is the skinny on parts availability for IC1 and IC2. IC1 can be purchased on DigiKey. First, it is important to know that the Motorola part number cross-referenced to ON Semiconductors. The ON datasheet is attached for reference. So apparently, the Motorola version does not exist. There are 2 differences between the Motorola datasheet and the Texas Instruments (TI) datasheet that ALIENR2 provided. First, one difference is in the Maximum Quiescent Supply Current (Icc). The Motorola version is rated at 1uA and the TI version is rated at 2uA. Second, the operating temperatures are different. The Motorola operating temp rang is -55 to +125*C. The TI operating temp range is -40 to +85*C.
Since the original IC on the board was manufactured by Motorola and the data sheet specifies an Icc of 1uA and temp range of -55 to +125*C, then the ON Semiconductors component is the preferred IC. However, the TI version would be an acceptable alternative. Note to any Member who replaces these components in the future: these are proposed replacements. They should replace the original components without any loss of circuit functionality. Please provide feedback on your repairs and/or post any research to counter these proposed replacements. any known fixes or causes for the jumpy tach problem? What is your tach doing? 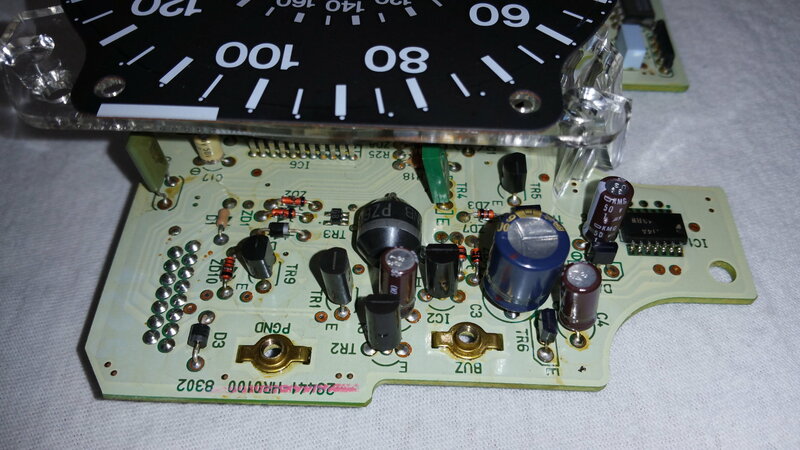 Have you done any troubleshooting on your tach and/or speedometer board? If so, what are your results? You could also try the PDF file in this link: Rev counter going crazy! A parts search for TR1 and TR2 proved rather challenging. First, the attachments are for 2SD1922 made by Hitachi (2sd1922.pdf) and the 2nd is for a replacement transistor, BC388 made by ON Semiconductors (BC337.pdf). Finally, searching for the components was a bear, and may grow more challenging in the future. When comparing the original to replacement components, their specifications are close but are not equal. The BC338 transistor is slightly inferior in Pc (Collector Power Dissipation), Icbo/Iceo (Collector Cutoff Current), and Hfe (DC Current Transfer Ratio) characteristics, to name a few. Based upon these differences, I believe it is better to locate the original transistor, 2SD1922. This was challenging to say the least and I anticipate the search to be much harder in the future. I located one store online that sells the 2SD1922 component. The store name is La Mesa TV Supply Company and the component can be found here: La Mesa TV Supply - 2SD1922. NOTE: This component was available at time of research (16 Sep 2017) and may no longer be available as time marches on. Therefore, your mileage may vary. I found the replacement component on DigiKey after plugging in some of the specifications from the 2SD1922 datasheet. I want to reiterate, this is a near replacement for the original because some specs are different, as stated above. However, if a member would like to experiment with this component then please provide your feedback and experience. A long-term test may be in order because the device may initial work but may decline quicker than the original. At least this component wasn’t switched to a SMD...yet. And again, thanks to ALIENR2 for the initial research on TR1 & TR2! I think all this research helps get his post count up. I looked into a replacement for IC3 since we are researching components. The likelihood that this component would fail is minimal. Because this IC stores the car's odometer, replacement of the chip or swapping it with another alters the car's mileage. As discussed earlier, there may be some administrative burdens with its replacement. However, from a component perspective, a replacement is possible. There is one catch - the replacement operates at a clock speed of 2MHz instead of the original 1MHz clock. This could potentially mean that the IC wants to update its information at twice the speed. I cannot say with certainty that the new IC would clock down to 1MHz nor would the data (odometer measurements) be accurately written/stored/recalled. Attached is the replacement and original IC datasheets. Any thoughts? NOTE: Replacement of IC3 with this proposed replacement may cause inaccurate odometer measurements. Additionally, refer to applicable local/state/federal laws concerning electronic odometer repair/alterations. P.S. A fun fact about IC3 is that it has a memory retention of 100yrs! So, odometer readings past 2092-2095 may be significantly impacted.